This will be another shorter post, I’ve spent quite a good bit of time with the Vive and soon I wish to write a more in-depth review of it but in short – it’s absolutely amazing. I didn’t think VR gameplay would be this good, but it just is. I’m super hyped for the future of what the Vive is going to be able to do. Sure, its current price point is pretty high being a $799 product so not everyone is going to be able to get their hands on it… but if you ever get a chance to test one out yourself I guarantee that you’re going to do everything you can to own one for yourself! The best part about the Vive experience for me is how accurate the lighthouses track the headset and the controllers. When you pull the trigger on the controller half way, you’re going to see that in the headset. When you push in any of the buttons, you’re going to see those buttons getting pushed in – virtually. It blew my mind and still blows my mind after seeing hours of how well everything is tracked. There are a few moments where the headset will lost sight or the controllers will go wacky but I think it’s more due to me not having my lighthouses in the most optimal positions. That and it rarely ever happens for me to really care so much. When you walk in the space that you trace through the tracking system you will feel like you’re actually walking in the game. It is said that the lighthouses can track a space that is up to 15’x15′ which would be more than enough space – at least for all of the games that I’ve played so far. Today I purchased a new title called Out of Ammo for the Vive. It’s a mixture of tower defense and first person shooter and I’ve got to say, it’s probably the best experience I’ve had so far. The graphics sort of turned me off when watching gameplay videos on YouTube and looking at the screenshots on the store page but since it was so highly rated and I never really heard anything bad about it I decided to take the plunge and try it out. This title is total proof that graphics really aren’t going to matter for the Vive. Sure, a game that looks great such as PoolNation VR is pretty awesome for aesthetics but in VR, it’s all about how a game plays and how it feels to play it. In Out of Ammo, you’re either commanding troops to certain parts on a map to defend against waves of enemies by building sniper towers or bunkers and assigning them to the areas or you’re actually in the bunker shooting at the waves of enemies! 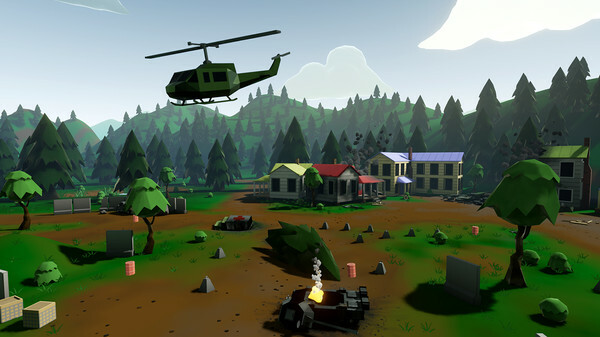 At any time you can take control of the different types of troops and you use the controllers to aim, shoot and reload. You have to actually pull a magazine out of the M16, grab another mag from your side and slide it into the gun again in order to have the ammo. It feels awesome ducking for cover, reaching for another mag and throwing grenades at enemies. It all really makes you feel like you’re in a battlefield believe it or not – I know that the graphics don’t present that – but this game really hits the spot for the overall feel. The waves of enemies get harder and harder as you keep progressing and there are even global leaderboards to compete in. I reached a little over 50 waves on the desert map and I ranked 280th on the leaderboards! I’m definitely going to be putting in a lot of time into this game and I don’t regret the decision of buying it at all. Right now it’s $15 on Steam in early access yet it still feels like a full game. It’s also awesome that the dev team is super active and adding new content – there’s a multiplayer and mission mode coming soon! Like I said, I’m going to be writing a full review of the Vive after I get some more time into it but so far, everything is exactly how I wanted it to be. 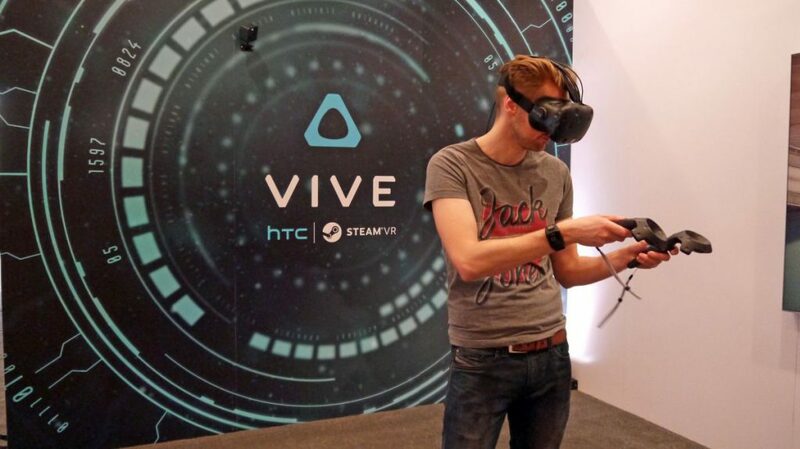 If you have had a vision of VR where you are looking around and in real time you’re seeing things, moving your hands around and seeing them move and shooting guns, reloading weapon magazines or simply throwing stuff – the Vive is exactly that. You can definitely tell that Valve took their time to get the Vive in an almost perfect state. There are some thing such as it not being wireless and the resolution is a bit off in the corner of your eyes… but those couple of cons disintegrate when you’re in-game. There’s something about room-scale VR that makes all of the bad just disappear. So, have you tried out the Vive? What future things are you looking forward to with it? Tagged virtual reality, vive gaming, vr gaming. Bookmark the permalink.